Drew’s new cover. Judge away. When Sydney Schake, the cover’s wonderful artist, and I brainstormed the original book’s cover for Memoirs of an Ordinary Girl: The Middle-ish Ages and I then saw her interpretation, I was thrilled. The second book’s cover has pleased me every bit as much, and I owe her my thanks and gratitude. She is also threatening to continue making some changes (artists! ), so this may not be the final version, but I like it. I wanted the feel of the covers to be similar since this is now a book series. They had to match each other, yet reflect the personality of each book as a separate entity. Once again, it models the paper bag book covers that were so common in the days when I was Drew’s age. The doodles, scribbles, and scrawls take me back to that time and each is somehow featured through words within the book’s pages. 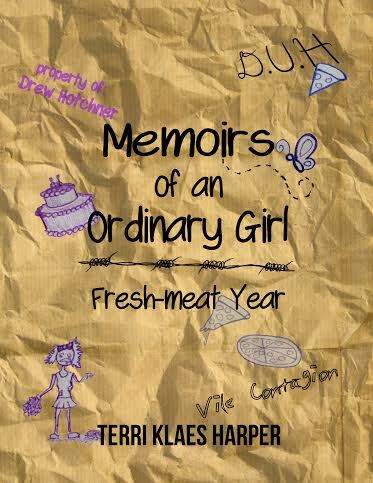 Having this artwork brings me that much closer to the release of Drew’s freshman, or “Fresh meat” year. I’m excited to share. The book is set to release May 30 through Amazon as both an ebook, and trade paperback. I’m just finalizng the details now. Posted in Author, Uncategorized and tagged book cover art, book cover reveal, freshman fiction, indie author, Young adult literature. Bookmark the permalink.